The ice cream industry has come a long way from being an unorganised one to an organised one. Previously we found ice cream hawkers selling homemade ice creams at streets, parks and playgrounds. Then was the turn of mobile pushcarts, tricycles or three-wheelers from the ice cream companies along with the availability of their products at local retail and kirana stores. And then followed the opening of ice cream parlours. The market for organised sector is restricted to large metropolitan cities and tier I cities. Rs 2,000 crore is the estimated size of the Indian ice-cream market. Of this, the organised sector, which is growing at 20 per cent per annum, accounts for only around Rs 200 crore. It is since the adoption of the policy of liberalisation by the Indian Government regarding the ice cream industry that this sector has shown an immense annual growth. Growth has also taken an upturn with the introduction of exciting flavours and opening of parlours around the country. Promotional activities help a lot in the sales of a brand. Companies figure out different ways to promote their brands. A few brands come up with new flavours or introduce special offers on festivals and occasions. Special flavours are introduced for attracting the younger generation which is the opinion maker now days. Schemes for Valentine’s Day are the most common. Players in the industry are increasing the amount of advertisement expenditures they make for their brands. Advertisements in newspapers, magazines, radio and television have become a frequent site. The demand and market for ice creams is definitely much more in the bigger cities as compared to those in smaller ones. The ‘A’ class cities of India along with the smaller B and C class territories that surround the main markets are the main regions which ice cream retailers are targeting at. 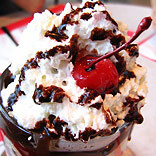 Ice creams are so popular that in the US every July is celebrated as the National Ice Cream Month. Ronald Reagan designated this month as national ice cream month in 1984. He also appointed the third Sunday in July as National Ice Cream Day. The future seems bright for this industry with many international brands foraying into this sector. The organised ice cream sector has brought more innovations by offering special flavours for the health conscious and the diabetics. The future is very bright for the ice cream market in India with increase in number of malls. Also with increasing wallet size and innovative modern retail formats, it has definately given a push to the ice cream industry in India. The perception of Ice cream as a seasonal indulgence is slowly changing to an all-year consumption product.